Who loves Paper Trey Ink Stamps? I do, I do! I just got my order last week and had to head out for a conference the first 1/2 of this week. I thought about these stamps the whole time. I couldn't wait to get home and color. I jumped right into the Autumn Scarecrow set and whipped out my Prisma pencils first thing yesterday morning. I had so much fun with this one. I did color his jacket red at first, but decided to do something a little different. Here is today's video. I'll post all the insructions and supplies below the video. I started with a piece of 4-1/4" x 5-1/2" white cardstock and stamped the scarecrow in black ink. Using my Prisma Markers, I colored in my image and then stamped the sentiment. 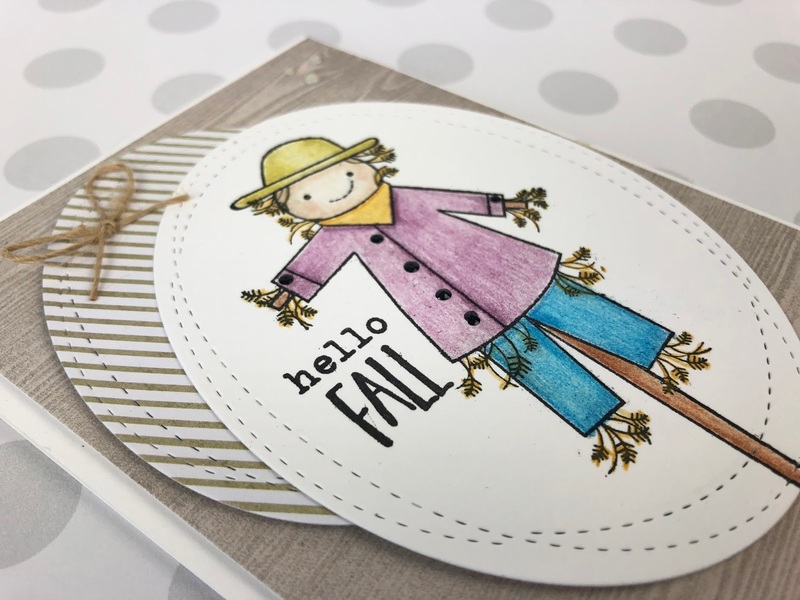 Using some wonky oval dies, I die cut the scarecrow with the largest die in the set, and then used some pattern paper with an oval the next size down. With another piece of pattern paper, I trimmed it down to 4" x 5-1/4" and matted that on my card base (4-1/2" x 5-1/2"). After layering my stamped image and the pattern paper, I added a twine bow and some crystal drops. Don't forget if you have suggestions for videos, please use the link above or on the side of the page. Love the way you put your cards together. Don't like the music, sorry.